I like it! the simplicity is appealing. 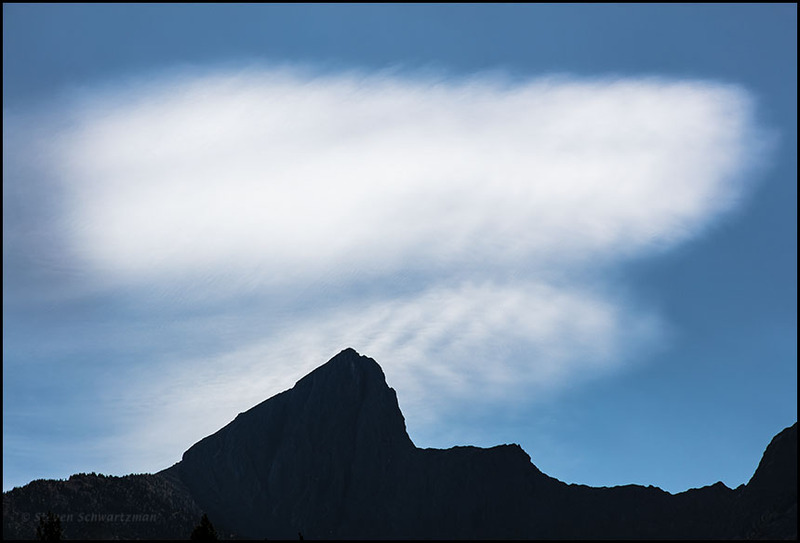 The striations in the lower clouds are about the same angle as the slope of the peak. Hail, Simplicity! The concept appeals to me enough that I’ve used the tag minimalism on various posts. It’s good of you to point out the parallelism between the striations and the left edge of the mountain, and of course the contrast between hard and soft. Fabulous. The contrast between the sharp, black peaks and the diffuse, out of focus clouds is unusual and, dare I say, unique. It was that contrast between the soft clouds and the hard outline of the mountains that got to me. Exposing for the bright clouds caused the mountains to go into silhouette. I could see the details on the mountains when I was there, and I could’ve reclaimed some of them in processing the image, but I found the contrast between light and dark more appealing. And as I’ve said a few times, I’m all for uniquity. Was this a long exposure? Those clouds look like they’re in a hurry to get somewhere. The amorphousness of the cloud was intrinsic, not due to movement over a long exposure. The cloud was bright, so I lowered the ISO to 100 and still had to go to 1/800 on the shutter speed to keep from overexposing.